The Galaxy Note 10 Unpacked announcement is not until August and the release will likely go into September, but the rumor mill is already churning tips and speculation at full speed. We learned the other day that Samsung may be so content with its strategy to split the S10 line into four tiers depending on the features and the resulting price that it will also go this route with the Note 10. Thus, the S-Pen warrior with a 6.75" display that was agreed on by Samsung's production team back in December, could be joined by a smaller Note 10 for some markets that have fallen for that most compact of Samsung's spring flagship quartet - the S10e - and made it a runaway sales success there. Will there be any other differences besides the overall dimensions between the two Note models, and will the smaller one be called Note 10e? Well, we can't answer the second part of that question but there are some new details regarding the first. As if there was any logic-defying doubt, Korean media is probing its Samsung supply chain sources today to learn that the Note 10 will land with the hexa-camera set of the Galaxy S10 5G. That's four cameras at the rear and two at the front or a record in the industry, as the Nokia 9 PureView also has six cameras, just five on the back. The rumored smaller Note 10 version, however, which is said to be destined mainly for the European market, is coming with a penta-camera, most likely without the time-of-flight sensor. Thus, the Note 10e, or whatever it gets named, is likely to inherit the camera kit of the Galaxy S10+, while the Note 10 (or 10+, depends on how it ends up named) will add the ToF camera that is on the S10 5G. In fact, the Korean publication claims that the quad-camera arrangement on the back of the Note 10 will be horizontal, or exactly the same as on Samsung's most powerful member of the S10 tribe. The company issued the first quad-camera phone with the A9 (2018), but its sensors and lenses are arranged vertically, one below the other. Will the Europeans be mad they won't get the depth-sensing camera of the larger Note 10? We'd wager to guess not too much if their version of the S-Pen carrier is more compact, easier to handle, and at a lesser price than the souped-up 10. 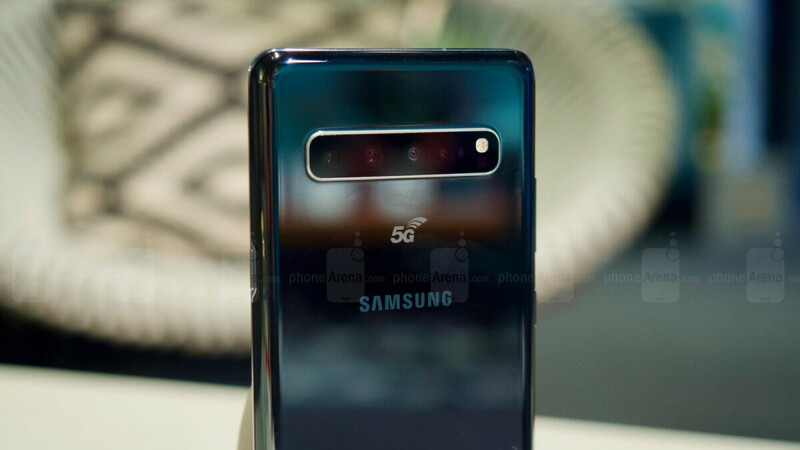 Moreover, the ToF camera is yet to prove itself in battle - the Galaxy S10 5G will be released tomorrow in South Korea to take advantage of the nationwide 5G network rollout there, and we are yet to shoot some portrait shots and bokeh samples with it. Long story short, the Note 10 is already shaping up to be the most powerful star in the Galaxy, as can be expected. The Samsung Galaxy, that is, as it will sport the best that the company can offer - a huge 6.7" Dynamic AMOLED display, most likely a 12GB RAM/1TB storage version, giant battery, and, surprise, surprise, a hexa-camera kit that covers all the photographic bases there are. The twist this year, however, is that we might very well see a smaller, funkier version that could come with a lesser price tag as Samsung cuts corners where it won't make a big impact, such as ToF camera presence that likely won't affect your decision to buy if you are into more compact phones like the Europeans apparently are. The icing on that rumor cake is that we now know how the Note 10 camera might behave, judging from our S10+ samples, and will soon learn what the Note 10+ quad set on the back is capable of when we get the S10 5G. Good times. Meh, the time of flight sensor is not that useful as of now. It has its applications in 3D face scanning, but no one is using it for that. The Note 10 should use a bigger, badder main sensor to compete with the P30 pro. I mean, $200 phones like the Redmi Note 7/Note 7 pro have bigger sensors than the S10 series. This multicameras are getting ridiculous. It also increases the price of phones. No one uses all of it anyway. No one asked for it. lol buddy, depends on your field of work. I have a small delivery company,with every delivery you have to scan bar code take pictures to send to customers and contracts,add to that have people sign for the service digitally (S-Pen its a saver),sometime in the darkest condition etc. Its just depends on the user. The Motorola's are great for backup. I hope in note 10 they will return the design of the back panel with note 8. These phones are getting too big. Maybe if you are small , and have hands , and small you know what but not for us guys with big hand , big you know what. All guys that use Note , have big packages. Yea all you iPhone owners , iPhones omits double or even triple the radiation . That's why apple iPhone users have small balls and small packages. And they are probably less likely to have kids cause of infertility. So keep putting your phones next to your balls servers you well for using that H O M O device. Yep you surely have small package to deliver lol. You are probably have tiny delivery package. But anyway dont confuse thinking penises about with wanting to ride one ,like seem to think( that's your thing). I think if we did a survey which phone gay's and women are likely to use (and as long as you tell the truth) you realize you are more likely to be gay if you use an iPhone. Your level of intellect is really showing and you should stop while you're ahead. Writing is clearly not a strength for you. As for the last part of your response, if that's what you want to call that, it's completely irrelevant to why the Galaxy Note series are larger phones and arguably the least intelligent response you could have given. I will forever assume you are one of the unfortunate who suffer from micropenis. I'm a note owner and like I said I have everything big, big hands , big phone and big package and big sagging balls. On the other hand I think you are a loser iPhone owner with a small package. iPhone is for little girls like you. I've been using Android smartphones in general since the OG Droid (Motorola Droid) back in 2009 and Samsung smartphones since the Galaxy Note 2. There's no other mobile OS and for the time being smartphone brand for me. Samsung is the leading manufacturer in the Android market in terms of smartphone options, build quality (outside of the Galaxy Note 7), etc. I'll continue to purchase Samsung devices as long as their smartphones continue to align best with what I'm in the market for. Right out of apples playbook.